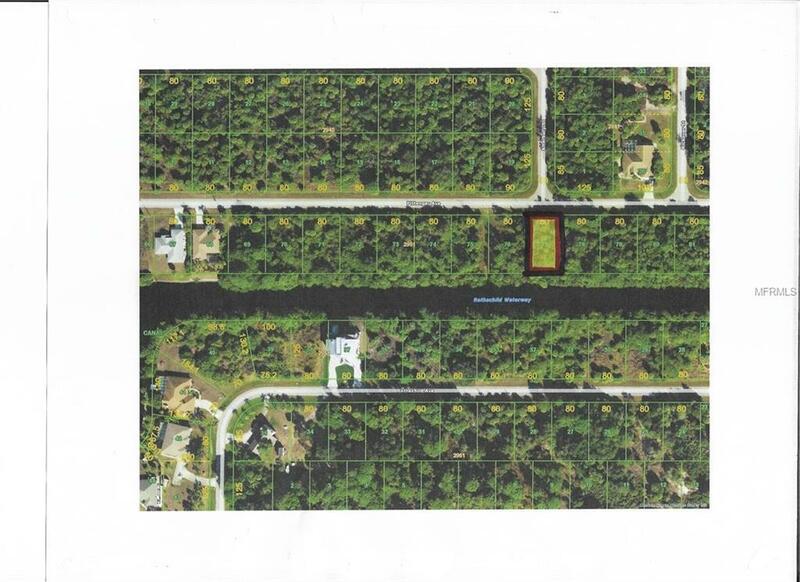 WATERFRONT..BEAUTIFUL FRESHWATER LOT ON THE ROTHSCHILD WATERWAY, JUST WAITING FOR A GORGEOUS NEW HOME. THIS IS IN AN AREA OF NEW HOMES CENTRALLY LOCATED IN PORT CHARLOTTE SO THAT IT TAKES MINUTES TO REACH FUN THINGS TO DO. SUCH AS GOLF, RESTAURANTS, BEACHES, SHOPPING, BASEBALL, FISHING. TAKE YOUR COOL DRINK OUT BACK IN THE LATE AFTERNOON, RELAX AND WATCH THE SUNSET AND ENJOY THE VIEW. INVITE YOUR FAMILY AND FRIENDS THEY WILL LOVE IT.